Even when the sun was almost close to gone, the heat was still here. It was ridiculous. So what is better than wearing all white! Okay, not all white, but close to it. Also, I was given this awesome slave bracelet from Funny People Co.! I love the little turquoise stone on it! On another note, I will be leaving for Florida tomorrow night! 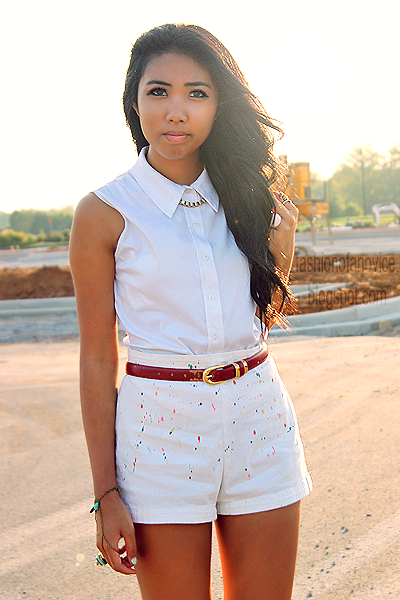 Bronze slave bracelet: c/o Funny People Co.
Oh I love your look ! This is such a great outfit! Simple but gorgeous pieces accented with beautiful jewelry. That bracelet is super awesome too. I'm glad I started following you on bloglovin! =] You have such an awesome and easy to relate style! ...a slave bracelet? lol that's a little awk.